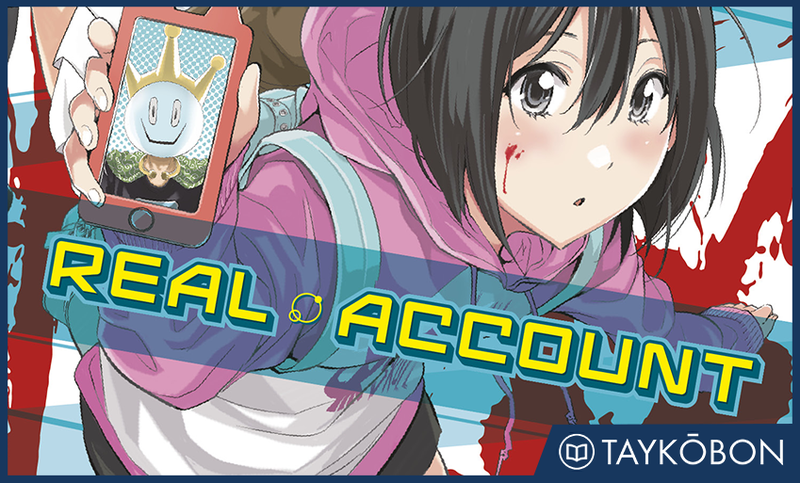 Ataru and Koyori have survived the first round of social-media based death games, but they’ll have to confront their own hidden secrets if they want to escape from Real Account. 10,000 users of the social networking site Real Account have been sucked into the network to play in a life-or-death survival game. The premise is simple - if you reach 0 followers, you die, and if you die prematurely in one of the challenges, all of your followers die. Together with his new companion Koyori Kanda, Ataru Kashiwagi manages to survive the first two deadly challenges, but the onslaught continues as the surviving players continue to be pitted against each other. Although Ataru’s brilliant strategy allowed him to defy the system in the second game, he’ll be in tough to survive when the dark pasts of all of the remaining Real Account users are brought to light. One of the things that really made Real Account stand out from among the continually growing legion of “trapped in the game” series is the way that it used its setting to deliver a clear critique of social media tendencies. This is continued strongly in this volume as Ataru and Koyori face a third challenge called the “Dark History Trials”. In this challenge, 10 players are put together along with their respective “tweett” histories, with the goal to use the other players’ unsavoury tweetts to reduce their followers to zero. I really liked the premise of this challenge for the way it creatively incorporated a very real issue into this series in critiquing the use of a person’s history to defame them. Although this critique continued to admittedly be a little bit on the nose, I liked the bite it added to this volume’s story, and I felt it was effective at continuing draw parallels between the real world and the situation faced by the players. The Dark History Trials challenge takes up the majority of this volume and advances the story in a solidly compelling manner. I found it morbidly entertaining watching the various players revealing their own inner rottenness in trying to outmaneuver each other by exposing their tweets, and I enjoyed trying to guess who would survive the game. This was helped along by the inclusion of new villain Aiji Hoshina who provided a unhinged and occasionally bizarre foil for Ataru throughout this volume. Aiji felt like a necessary inclusion into this volume in order to compensate for Ataru’s unwillingness to really participate in the games, but came off feeling a little bit artificial at times as a way for the author to push the plot forward. I didn’t find him to be the most compelling villain, but I think he was used well for the most part in pushing Ataru throughout the volume. This storyline led to some truly heartbreaking moments, and I really enjoyed the way that story used the various mechanics of the game to push the plot forward in interesting if a little bit predictable ways. This predictability is my biggest complaint about the series so far because the plot never really feels like it moves in any unfamiliar directions, and the characters act more or less like you would expect them to in this type of story. However, the strength of the setting makes up for this by telling this familiar plot in an interesting way, and this kept my interest throughout the plot of this volume. One of the best parts of this volume’s story was the way that it developed Ataru’s character throughout the Dark History Trial. It comes to light midway through the volume that Ataru has a deep and dark past lurking behind one of his tweetts, and after Aiji attempts to use this tweett against him we get a full exploration of Ataru’s backstory. I actually ended up enjoying this segment a lot more than I was expecting because of the unexpected twists contained, and I was pleasantly surprised at the depth shown here. This did wonders to flesh out Ataru’s personality beyond being a one-note protagonist, and I felt more invested in his struggle throughout the duration of the volume. Although we’ve yet to see Koyori’s personality fleshed out, I was really happy to see Ataru’s history given the spotlight in this volume in a way that gave his final confrontation with Aiji more emotional resonance than I was expecting. Real Account’s art continues to complement its story quite well, and I enjoyed the clean and recognizable designs of the characters within. I thought that the art did a really good job creating a strong horror atmosphere by portraying the more violent and grotesque scenes in a rougher style of drawing. This contrasted well against the relative cleanliness of the virtual world and served to convey the danger of the situation these players find themselves trapped in. This adaptation in art style that highlighted the fear in play also extended to the more cathartic emotional scenes, and I liked that the style would lighten significantly to signal the tone of the story effectively. Real Account’s second volume is a solid addition to the series which effectively builds upon the social critique rendered in the first volume. Although the main story points aren’t anything special and feel a little bit convenient at times, the method of delivery in forcing the players to participate in competitions related to social media did a good job of keeping me interested in the story. The focus on Ataru’s backstory was welcome and needed, and I’ll be very interested to see what type of challenge this series throws at him in the next volume. Real Account Vol. 2 was translated by Jonathan Tarbox and Kazuko Shimizu, and published by Kodansha Comics USA on May 24th, 2016. Authored by Okushou with art by Shizumu Watanabe, the series is ongoing in Kodansha’s Weekly Shonen Magazine. Volume 3 will be released in English on July 12th 2016.